My grandfather was a crazy gardener. I remember going to his house for Christmas and the whole basement being filled wall to wall with starter plants and the long grow lights hanging above. It was December in Minnesota, we typically hadn't seen green since October and definitely hadn't felt temperatures above 40 degrees since then either - but he had this little haven right below our feet. Come summertime there was always an abundance of fruits and vegetables. Seemed no matter when we visited, there was a basket of veggies for us to take home and a cucumber salad in the fridge. My affection for cucumber salad lives on. With the basics in hand, I make many variations and love them all. 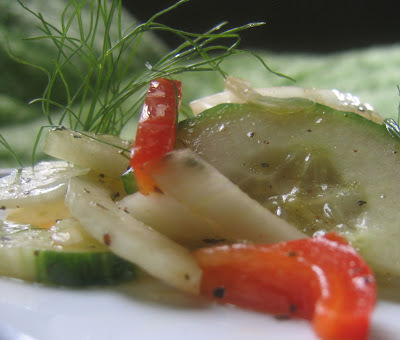 I have also discovered my fondness for fennel over the past year; so it just seemed natural to combine the crunchiness of the two subtle flavors. This is great as a side dish to almost any meal, particularly grilled meats, and it keeps well too! I miss having an actual garden to pick my fresh cucumbers from, but have found many great farmers markets in the city. As always just have fun with it, enjoy the summer harvest and be fat and happy. roughly 1/4 to 1/2 cup olive oil. Drizzle this slowly while whisking until the dressing has come together. Pour dressing over salad and toss. Allows flavors meld for about 15 minutes if you have the time. I like to serve at more of a room temperature to allow all the flavors to really burst through! 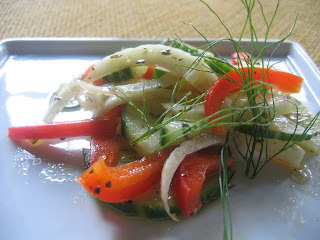 Garnish with the fennel fronds for a pretty presentation.